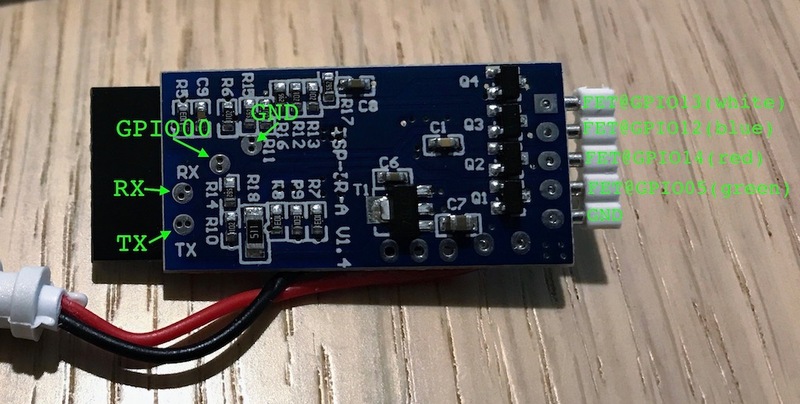 Board is essentially a ESP-12S (or ESP-2M) with necessary voltage converters, little bit of flash, 3 or 4 MOSFETs to drive LED strip (depending on the model), connector for LED strip and optional IR receiver. Module is powered by 12V that is used to power LED strip as well. RGB models are declared as 144W, RGBW models as 192W. Board has RX, TX, GND and GPIO00 pads exposed on the bottom side of the PCB. You need to solder temporary wires those pads. You need to power the board while keeping it connected to the programmer. With all Sonoff boards that work with AC, this is a big no-no that will fry your programmer, your Sonoff and might even get you killed. 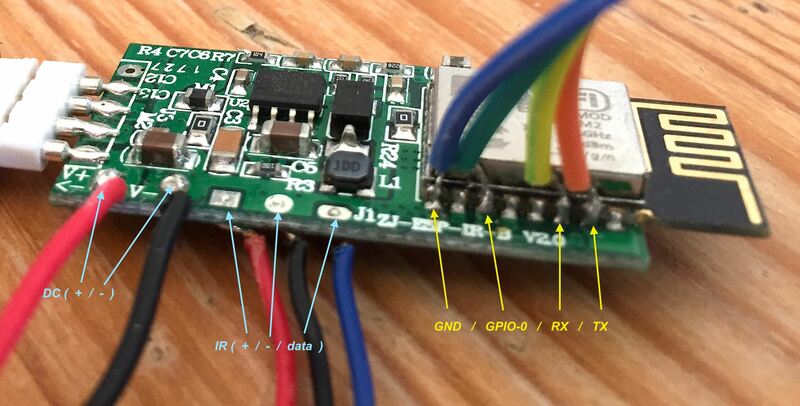 In this case, you'd be dealing with 12V, so the only thing that matters is to connect the GND of your programmer to GND of the board before you supply the 12V. Not doing so might fry your board and/or programmer, but would definitely not hurt you. Connect your programmer to a breadboard and notice the locations of GND, TX and RX columns. Solder 4 jumper wires to 4 exposed pads. 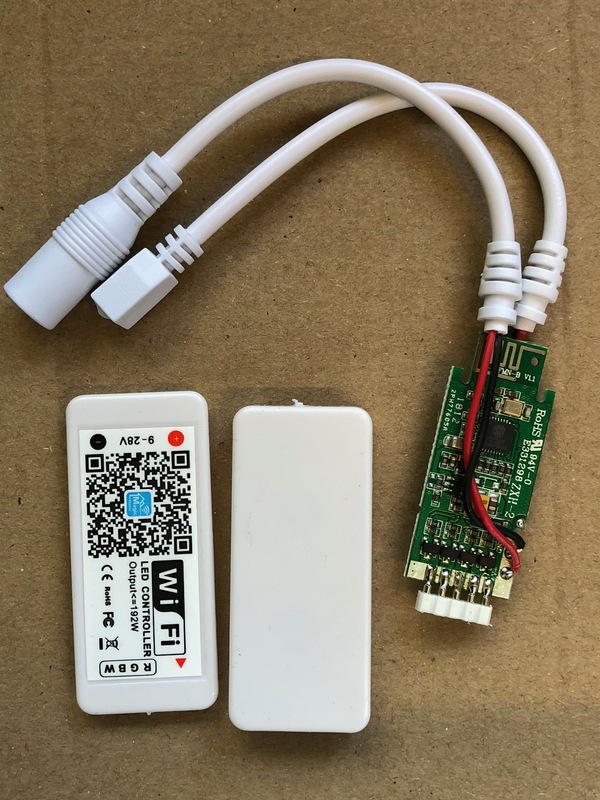 Connect RX from the MagicHome to TX on the programmer. TX from the board goes to RX on the programmer. 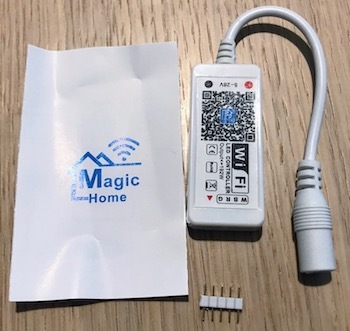 Connect the 12V power supply to MagicHome. 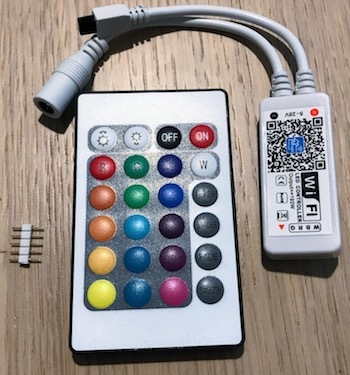 As GPIO00 is connected to GND, board will go into flash mode. Disconnect GPIO00 after few seconds. Upload Sonoff-Tasmota like it would be any other board. Disconnect RX and TX and then only then GND. GND gets disconnected LAST. You can then connect the power back to the board and Sonoff-Tasmota should be running on it. 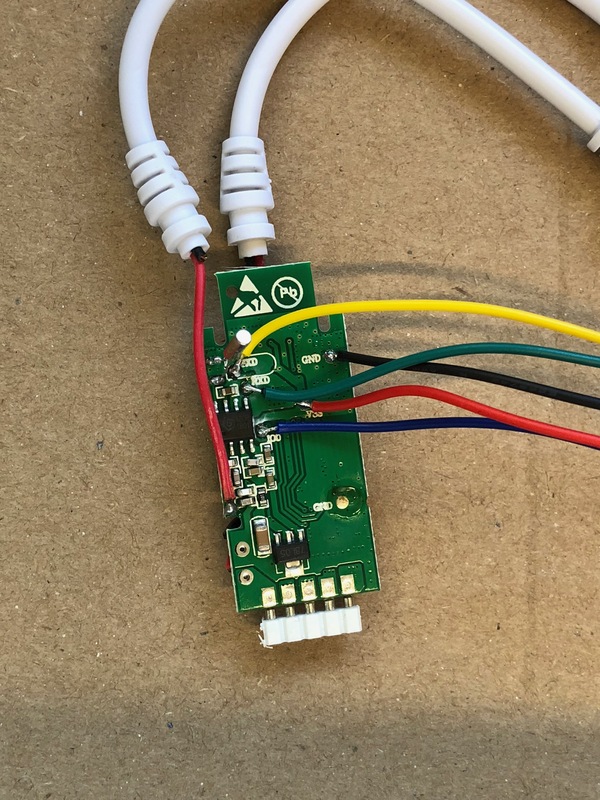 Once you verify that board is up and you can access it over the Web, you can unsolder temporary wires and update subsequent firmware versions using OTA. GPIO04 - on non-IR boards, it's an open pin you can use for Onewire, button or something else. It might have pull-down resistor and/or bypass capacitor, so please take that into consideration. 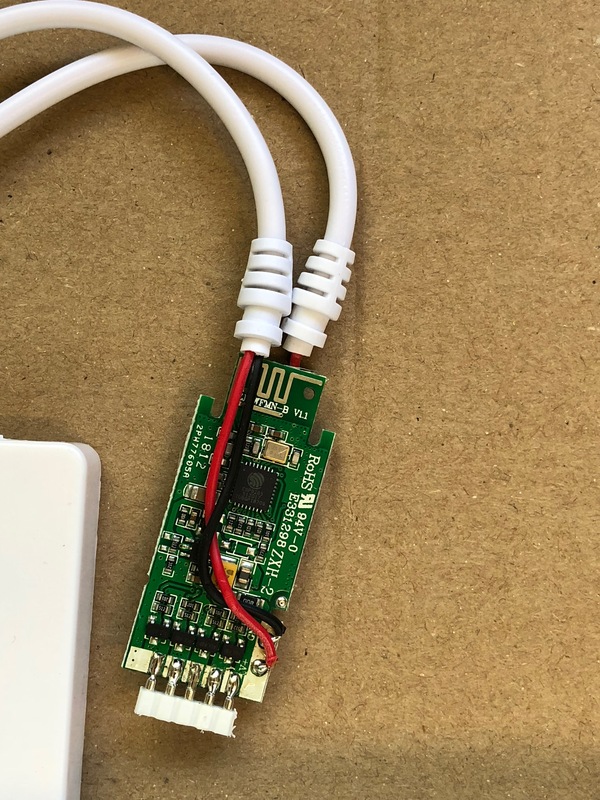 On IR-enabled boards, IR receiver is connected to this pin, so you can use IRRecv as functionality. 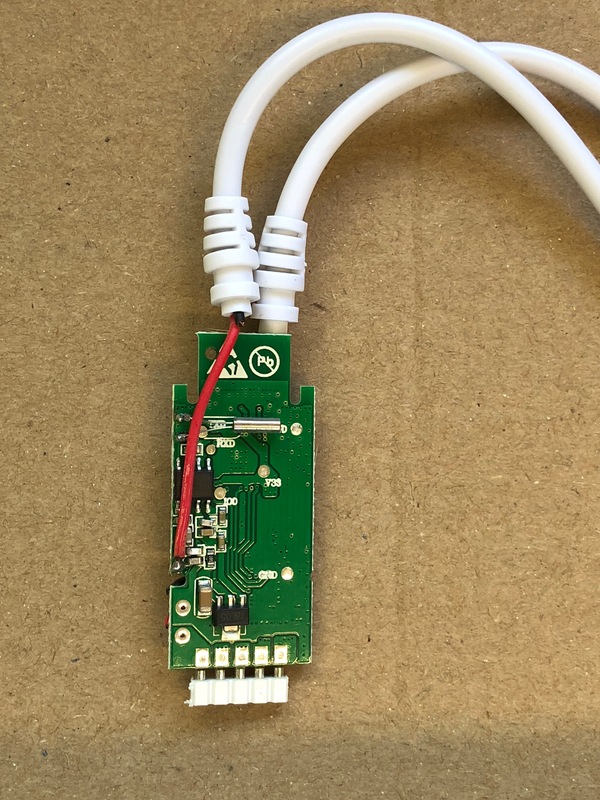 GPIO13 - This pin is not used on RGB board (so you'll leave it as "None"), but on RGBW, it's driving another channel (cold white or warm white) for LED strip. 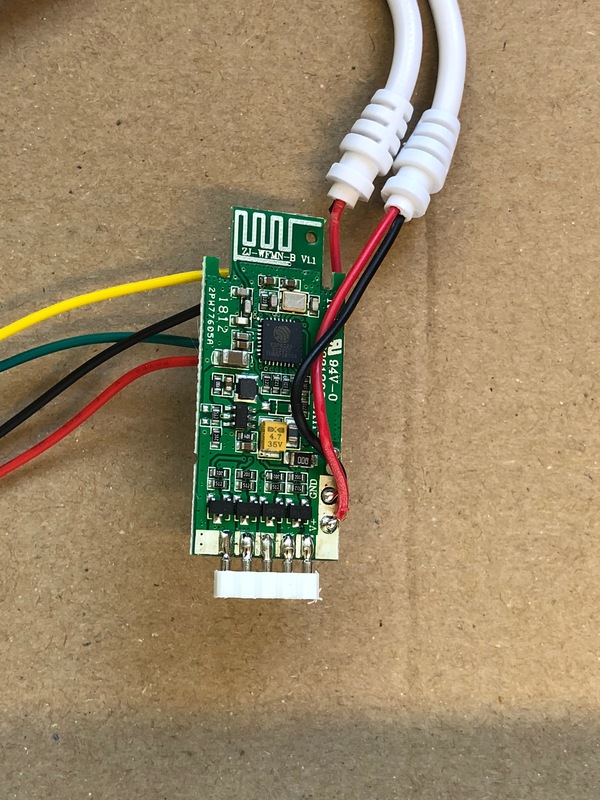 Aside from it going 9-28v, there are no other external model numbers etc, however opening it up revealed a very different configuration inside, using an ESP8285 chip directly on the board. I found that on the back it has pads to solder to so you can flash it. The IO0 port is GPIO0 that needs to be pulled to ground when powered on for flashing (as per all ESP devices). I soldered cables to each of these. Note that some are very close to other pads, so be careful. If you want to avoid soldering, also pogo pins work well with the pads. After chosing the correct module type in your Tasmota configuration, press a key on the remote after boot for the device to learn your code.